The drop ceiling, a ceiling with many names (suspended or drop down), are designed in a way to be “dropped” just below the ceiling to help hide wires, ductwork, and pipes, to name a few. Created from panels, a drop ceiling will rest in a grid-like system that is suspended from the ceiling joists and is often found in a basement. To determine the costs of a drop ceiling, it can be confusing as all panels will not be created equally. The cost to install a drop ceiling will greatly depend on the contractor you hire, the type of panels you want to purchase, the size of these panels, the height of your ceiling and your geographical location. As you can see, there are many factors, but for the most part, be prepared to spend anywhere from $4 to $7 per square foot if you intend on hiring a licensed and reputable contractor in your area. As for those who just want to do the job on their own, the tiles on its own can cost about $1 to $2 per square foot, while the supplies, if you do not have the necessary tools, can cost less than a hundred dollars as all you will need is a ladder, utility knife, tape measure and chalk string, to name a few. This FamilyHandyMan.com how-to guide goes into detail as to how the entire installation process works and which tools you will need to complete the job if you were to do it on your own. To estimate your costs for just the materials, ArmstrongCeilings.com has an easy-to-use calculator that is able to help determine what you should budget for supplies. 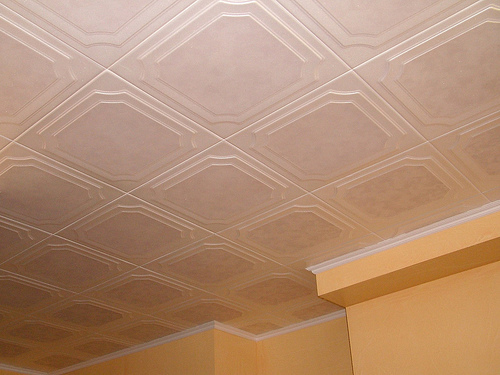 A variety of looks: Today, ceiling tiles come in a variety of looks, and while drywall often offers a boring white look, a drop ceiling could be the option if you want to jazz up your ceiling look. Whether it’s a coffered, wood or tiled look, there’s a good chance you can find it. Soundproofing: Drop ceilings are a fantastic choice for those who are looking to soundproof a room as these tiles can help dampen noise coming from a movie room or studio, for instance. Access: The tiles, even when installed, can still be easily removed in order to access the pipes or wires behind it. This can come in handy if you plan on fixing leaks, installing new wires in the future or just simply need access without the hassle of cutting your drywall open. Value: In terms of cosmetic value, a lot of people find them to be ugly, but this can point can either be a pro or con, depending on how you look at it. Many real estate agents have noted that a drop ceiling, instead of a drywall ceiling, can actually lessen the value of your home if you were to finish your basement. If you want the rest of your home to go with the flow, many experts do recommend drywalling your ceiling. Risk of sagging: Since these types of ceilings are almost always installed in a basement, you do risk the chance of the ceiling sagging in the future due to the moisture in your basement’s air. As the tile absorbs this moisture, it can begin to weigh the tile down, ultimately creating that sagging look. While some brands created a product to prevent this from happening, many tiels on the market do not. Not fun to install: Even if you feel you’re the master DIY guy/gal when it comes to installing something, installing a drop ceiling is actually harder than you think, most often due to the leveling it requires. In the end, if your tiles are not level as it should be, then you should be prepared to look at an uneven ceiling. Lose space: You will lose headroom when it’s installed, often about six inches, and for this reason, it may not be ideal if you’re taller than average. Ceiling tiles found at a local hardware store either come in a 2-by-2 foot or as a 2-by-4-foot size and are available in a variety of textures and styles. Some have a simple square pattern, creating the illusion of an actual ceiling, making the grid the tiles sit in less obvious, while others can have a portrait matte-like look, creating a luxury feel. In most cases, you usually do not need to pull a local permit to install new ceiling tiles; however, if you want to play it safe, talk with your local planning department to see if any rules apply. If there are any, it may be related to the minimum floor-to-ceiling clearance needed. Jason at ifinishedmybasement.com notes that a drywall ceiling, most of the time, can cost just as much as a drywall ceiling, if not more. If you think this is your best option for your budget, you may want to consider other alternatives as well to see how the pricing compares. When installing a drop ceiling, plan on losing about five to six inches of height when the job completes.